I’ve had a few light-bulb moments since beginning my Simple Year project. My most important one involves something I knew for a while but didn’t want to admit. 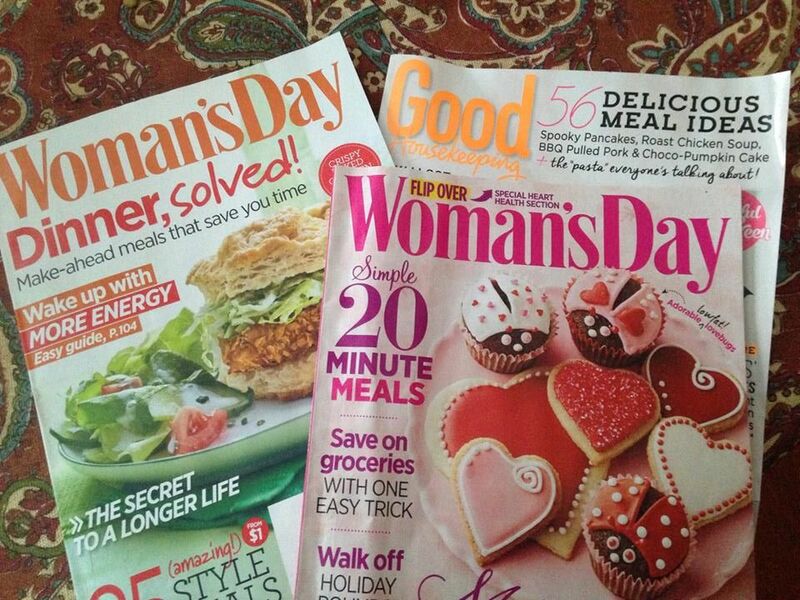 And so magazine covers with phrases like “Easiest Dinners EVER!” and “Quick Healthy Meals” always tempted me. But I never found any real solutions, because no article can make a person like to cook. Worse, I was adding clutter by buying magazines I didn’t need. I’m not buying any more magazines. I think my disinterest in cooking is why I’ve been unsuccessful at establishing a solid meal planning habit. My second and third objectives for this year merge a bit because I want to get into better home-related habits, and I want to make better meals for my family. Looking at my mistakes is important because I keep going back and trying the same routine, but it’s not sticking. I want to share what I’ve figured out, which I hope will help if you’re having similar issues. Mistake #1: Choosing Sunday as my planning and shopping day. I used to sit down on Sundays with a few cookbooks, and my browser opened to Pinterest. It was overwhelming and time-consuming. Sundays are not as stressful as they used to be, but I still haven’t shaken the bit of anxiety I always feel about the coming week. Trying to meal plan on an already busy day was never a good idea, and neither was trying to deal with crowded grocery stores. My Fix: I’m going to get in the habit of planning meals for next week on Wednesdays. Because I currently have Fridays off, I’m going to do my shopping on Fridays. The meal week will begin on Saturday. Mistake #2: Getting bogged down by too many options. My ‘Healthy Cooking’ Pinterest board has 186 pins. A few pins need to be moved to the ‘Food Which Will One Day Kill You’ board, but I still have way over 100 ideas. 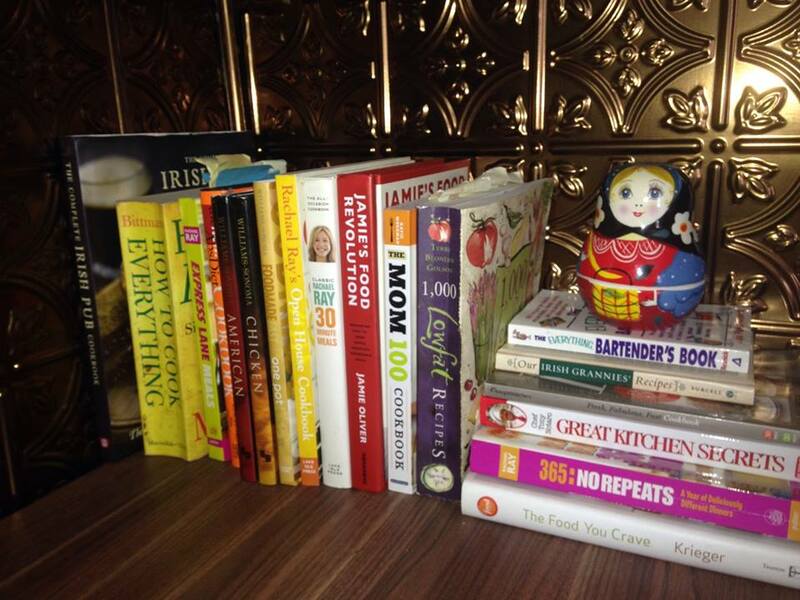 I pared down my cookbook collection to only keep my favorites, but I still have several. My head swims with all the ideas. I have a lot for someone who does not like cooking! My Fix: To plan each night around some sort of theme, which will limit the possibilities. I don’t remember the context but several months ago Emma rattled off a list of her ideal dinners. She didn’t even think about it: “Monday, pasta. Tuesday, tacos. Wednesday, pizza. Thursday, chicken. Friday, breakfast. Saturday, salad.” She ran out of steam before Sunday, but I liked the theory. I worked with her plan for a while, and then I stopped, which leads me to my next issue. I need to make this a routine, and I hope doing it on a different day will help. It’s something I’d do a few weeks here, a few weeks there, without a habit ever taking hold. And there was always one or two nights when I’d get home and just not want to cook. So we’d go out or order in even though I had the ingredients for a meal on hand. My Fix: I’m going to add this to my calendar so that I remember to plan on Wednesday and shop on Wednesday. I’m also going to plan more realistically, knowing I won’t want to make a full blown meal from scratch every night. Mistake #4: Trying to cook every single night. No real explanation is needed. I don’t like to cook and I don’t want to do it every night. My fix: I need shortcuts. For example, I like using my slow cooker, and one slow cooker meal can take care of two nights. I can also double recipes and freeze certain things. Not every meal needs to be complicated. Soup and sandwiches make a simple and satisfying meal, with minimal cooking. I need to add those to my plan. I will post my Month 1 Report in about two weeks, so I will share my progress then. Bon appétit! Very nice post. I can relate. In the past I would try and make an elaborate meal every night. It just wasn’t necessary. I would end up wasting a lot of items simply because I didn’t have a plan for them after that meal. Most of the dinners I now make have the same base (onions, tomatoes, ect). Less waste. I’ve also always liked one pot meals – less fuss. Sigh, I know exactly what you mean, I don’t like cooking either and I kept thinking that at some point in my life I would start to enjoy it (my Mum loves cooking and is a good cook) but at 52 I don’t think I am ever going to like it. I do think a meal plan might help so will be interested to see how you go. Love your ideas….and I think they’re manageable….and practical….I’m going to adopt your ideas and can’t wait to see another post about this in a few weeks…. we started a meal plan and it really helps. We actually do all meals except weekends at this point. We do allow one week night every other week for eating out or ordering in. I think the best plan is to make it fun. It seems Emma has a plan, so have her help. It takes some patience, but let her help. Pretty soon she will be cooking for the family. We have a few fail safe meals we turn to. One is chicken tacos (aka fajitas). I slice everything and throw it into a bowl on Sunday and cook it up on Monday. Tuesday night we chop up the leftovers and it is quesadillas on Tuesday. We also use a half of a pound of ground beef for one night and the other half for something different the next night, but remember we are a family of two. Another thing I hear (V hates) is getting a rotisserie chicken (best bet by use is Costco, if you have it nearby go there) and use it in many different recipes during the week. Again, Miss Emma can help! This may sound counterintuitive, but I also hate menu planning, so I plan a month at a time. I have a basic daily category like your daughter mentioned, and a spreadsheet with meals we like listed under the category, then once a month, I pick meals from those lists for the next 4-5 weeks. Then on the week of, I just make a grocery list. When assigning my daily categories I also take into account weekly late afternoon or evening activities or things that I know wear me out, so some nights are leftovers nights or really quick meals, and then I have other meals on days where I am not as busy. Good post, enjoying your blog! Will enjoy seeing how this works out for you. I like eating out a little too much. Meal planning and sticking to it is difficult for me also. I can’t say I love cooking, but I like trying new recipes, it seems variety is what I enjoy. Disorganization with all the recipes then becomes a problem. Totally agree with giving up the magazines though. Did that a few years ago and totally reduced the clutter . I think I need to start with “no more food or fitness magazines”. Then take another look at your mistakes. They match most of mine. Not only do I not like to cook, it got harder for me once I was only cooking for two. We’ve been trying to address this topic at my house too- I’m a working mom with three little kids and our dinner time routine has gone off the rails recently, so I decided it need to be streamlined significantly. I sat down with our recipe cards, pinterest boards and cookbooks and came up with a list of our family favorites- the kind of recipes that when it’s for dinner I think “Oh, I love this meal!”, and that I make so often I almost don’t need a recipe. I narrowed down the list to four categories: vegetarian meals we LOVE, really good crockpot recipes, family favorite foods (stroganoff, stir fry, lasagna, stuff like that) and soups. Each list has about 10 recipes, but I am PICKY about what goes on those lists- if it’s too hard to make, or good but not great it got the ax, and there are a few blank spots on my list if nothing was perfect. Then I assigned a week night for each category (Mon- Family Faves, Tues- crockpot, Weds- vegetarian, Thurs- we always have dinner with friends, Fri- always homemade pizza, Sat- nothing assigned, Sun- soup). So, with my short list of recipes I can do the meal planning for most of the week, and only have to figure out pizza toppings, and a dinner for Saturday, which lets me rotate in some variety. I have almost three months worth of recipes on the lists, so we really don’t get tired of the food, and it’s actually been really nice to keep eating our favorites. And SO much simpler to shop, and keep ingredients on hand (no sauces that only get used for one meal and then sit in the fridge forever). Also, I was able to get rid of a bunch of cookbooks that I was rarely using (I copied a few recipes, and then just let the cookbooks go). Meal planning has really helped us save time and money. I work four ten-hour days from Tuesday to Friday. We sit down as a family on Saturdays and try to figure out what we each want to eat the following week and which day. Then i go through the fridge and pantry before heading to the grocery store. I try to do as much prepping, cooking and baking as possible on Monday for the week. Making double batches to freeze is really helpful for those days after a hard day at work. I like cooking much better now than I used to because I don’t have to think about what to cook when I get home since I have it planned. Meal planning has been a struggle for me as well. I used to spend HOURS each week planning meals and making a grocery list. It saved time during the week, but sometimes I didn’t feel like eating what was on the menu that night and I always dreaded making the grocery list. I do things so differently now. I have a “master list” for the grocery store of things that we typically use in a week (milk, bread, eggs, etc.) I keep that on my computer so I can print it off before going to the store. But I don’t really make a specific list each week – I just go to the store, buy whatever meats are on sale that week, a bunch of veggies and fruit, my general weekly list items, and I’m done. I come home and cook whatever I feel like cooking each day. If I don’t have everything for a recipe, I improvise. Actually, I haven’t really cracked a cookbook open since reading Jules Clancy’s 2-minute Meal Plan (thestonesoup.com). Her “meal planning” inspired me to not sweat the dinner question so much and her laid back approach to making meals is awesome. And if I actually feel like being creative with dinner, I can open up a cookbook and go crazy. It has made my life SO much easier.